Chunk Light Tuna in Water delivers the trusted tuna taste that people have come to expect from StarKist. StarKist Selects products begin with the highest-quality, firmest, meatiest cuts of tuna for the most discriminating gourmet tastes – it’s the gold standard for canned tuna. 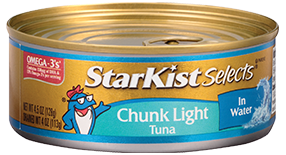 ++StarKist Selects® Chunk Light Tuna in Water has 130 mg of EPA and DHA omega-3s per serving.